(Phys.org) —Physicists are continually looking for ways to unify the theory of relativity, which describes large-scale phenomena, with quantum theory, which describes small-scale phenomena. In a new proposed experiment in this area, two toaster-sized "nanosatellites" carrying entangled condensates orbit around the Earth, until one of them moves to a different orbit with a different gravitational field strength. As a result of the change in gravity, the entanglement between the condensates is predicted to degrade by up to 20%. Experimentally testing the proposal may be possible in the near future. The paper, which is published in a recent issue of the New Journal of Physics by David Edward Bruschi, et al., theoretically demonstrates how relativistic effects impact the quantum world. "Our work shows that it is possible to test gravitational effects, which are thought to affect classical systems at large and very large scales, with genuinely (small) entangled quantum systems," Bruschi told Phys.org. "Our results aid the understanding of the effects of relativity on entanglement, an important resource for quantum information processing. Since we lack a theory that merges quantum theory and relativity, our work can help direct future theoretical and experimental efforts that investigate quantum effects at large scales." Besides being of fundamental interest, understanding how gravity and other relativistic features affect quantum entanglement will help physicists develop quantum technologies for space-based applications. In a sense, space-based quantum technologies will take classical space-based technologies such as GPS into the quantum regime. It's well-known that GPS satellites require relativistic corrections to accurately determine time and position, and the same will hold true for quantum technologies. While GPS is widespread, however, quantum technologies have not yet been developed for the space environment, although several ideas have been proposed. While most of these proposals fall under the framework of the theory of quantum mechanics, the new proposal differs in that is developed within the framework of quantum field theory. This theory merges quantum theory and relativity in the sense that matter and radiation are quantized, while space time is treated as a classical background. The physicists here argue that quantum field theory provides a better model for understanding the effects of gravity on quantum properties. Using a quantum field theory framework, the physicists have expanded upon previous research that showed that changes in acceleration affect entanglement. Due to the equivalence principle, this means that changes in gravity should also affect entanglement. This is exactly what the physicists found in their analysis. Their proposed experiment involves two space experimentalists, whom the scientists call Valentina and Yuri—named after Valentina Tereshkova and Yuri Gagarin, the first woman and man to go to space. Valentina and Yuri each prepare a Bose-Einstein condensate (BEC), an ultracold group of atoms occupying their lowest energy state, which allows quantum effects to become visible on the macroscopic scale. The BECs' phonon modes are then entangled with each other. Each BEC, which together with its enclosing and maintaining apparatuses has a volume of 0.5 liters, is then loaded onto its own 20 cm x 20 cm nanosatellite. Currently, researchers are working on the CanX 4 and CanX 5 nanosatellites with these dimensions. The nanosatellites start out by moving in the same circular orbit but in opposite directions. Then one of them receives a "velocity kick"—a change in velocity that moves it to an elliptical orbit. After navigating half of this new orbit, a second velocity kick puts the satellite into another circular orbit, different from the first one. Now the two satellites are in different orbits. 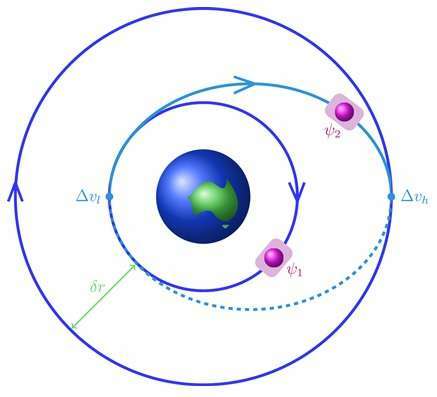 The degradation of entanglement between the BECs is expected to occur immediately after the orbit-hopping BEC undergoes its first change in velocity, and can be observed any time that BEC is moving in a different orbit. Although detecting entanglement between the phonon modes in BECs has not yet been achieved, it is currently a topic of great interest and may be possible in the near future. Since CanX 4 and CanX 5 are designed to determine positions with an accuracy of cm, even a small change in orbit should lead to an observable effect on the initial quantum entanglement. Although entanglement can suffer a relatively large degradation due to a change in gravity, there is a bright side to the effect. The researchers also found that the strength of the entanglement oscillates periodically with respect to the gravitational difference between the two orbits. This means that it may be possible to find a situation in which entanglement is not degraded by accurately controlling the satellites' positions. This is one way in which the results will allow researchers to maximize the potential uses of future space-based quantum technologies. "I believe that our results can be employed to develop future quantum communication and positioning technologies, ultraprecise accelerometers and navigation systems which would benefit from our better understanding of the interplay between quantum physics and relativity theory," Bruschi said. In the future, the researchers plan to further investigate both the fundamental and practical aspects of quantum and relativistic effects. "My goal is to develop space-based relativistic quantum technologies that will exploit both quantum and relativistic effects to bring the game to the next level," Bruschi said. "I believe that there is much to learn about the overlap of quantum mechanics and relativity theory at large scales and that the applications can be far reaching: from providing a theoretical basis for future space technologies to deepening our understanding of the laws of nature." So we shouldn't propose it for detection of QM effects at the orbit. Until we cannot achieve the entanglement between the phonon modes in BECs at the extremely quiet and still conditions of terrestrial labs, then we indeed cannot study its degradation at the noisy orbit. Or we will invest into just another Gravity Probe B fiasco. I think they will discover that the entanglement is lost instantly after the entangled particles are produced. If you manipulate one of them after both are produced they will most likely have already lost their entanglement.